There are 4 levels of quality of solar silicon cells, called "Grade" - A, B, C and D. Elements of different classes differ in their microstructure, which in turn affects their parameters and longevity. What is the difference between solar cells of different quality levels? Grade A solar cells are the elements of the highest quality. They lack chips, cracks and scratches, which lead to a decrease in the efficiency of conversion of solar energy into electricity. They have an ideal appearance, uniformity of crystals, colours, etc. If two halves of different elements are put side by side, it is impossible to distinguish them from each other. The filling factor of the CVC of such elements is more than 0.7. Elements of Grade A have the smallest defects at the start, their degradation will be the slowest. Manufacturers of Level 1 make solar modules under their brand using only elements of Grade A. Such modules usually have only a positive tolerance (i.e. the capacity of the modules is always higher than the passport one) and lower temperature coefficients. 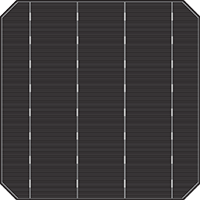 Grade B solar cells have visual defects and have a lower filling factor of the CVC characteristic: 0.4-0.7. Their price is usually a bit lower than that of the elements of Grade A. As they say - "second grade is not a defect", but the manufacturers of elements consider such elements as a defect and never make modules under their brand using this grade. The main difference from Grade A is visual defects, and not always, but it is possible to get good performance comparable to Grade A. However, there is one more factor - the filling factor of the CVC characteristic (see the reference above). Therefore, in Grade A it is from 0.7 and above, in B: 0.4-0.7. Many sellers of modules from such elements assure that there is no difference in performance and parameters of the modules from the elements of Grade B, and defects are only visual that nobody will notice on the roof except installers and birds. This is not true. These elements "grow old" faster and even initially their productivity is less - you can see this by making simple calculations and comparing the received power per unit area of modules from elements of Grade B and Grade A.
Grade C solar cells have defects that affect their operation and performance. Energy production by these elements is lower than elements of Grade A or B. The price is much cheaper. Micro cracks are visually seen, broken pieces of elements are broken and so on. No self-respecting manufacturer makes uses Grade C modules, they usually go to third-rate producers and are called "self-made" (which are happy with the price of such elements). The efficiency of such elements is always less than 12%. Modules of Grade C can be used only in systems with low voltage to charge batteries 12-24-48V. Grade D solar cells are broken elements, sometimes they are made of low-power modules from scraps, but mostly this trash goes into a re-melting process for a new silicon. They are simply considered unsuitable for use in modules, yet are safely used by unscrupulous module builders. Elements have micro cracks and can have the same defects as Grade B elements. Such elements are bought up, cut, using whole parts for soldering. To determine modules with a power of 80-100 or more watts made from Grade D elements can be easy: if the module is not made of solid elements, then it is most likely made out of culling. For modules with a power of 90-100W with a nominal voltage of 12V, 36 solid elements are required. If a module with a power of more than 90W is made of pieces of elements, and not of solid elements measuring 125x125 mm and higher - it is most likely that such a module is made of waste. Exceptions are the modules with a voltage of 24V - they should have halves of elements 125x125 mm. 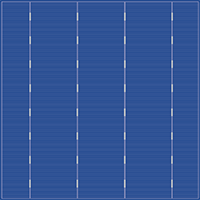 Similarly, of the 36 solar cells measuring 156x156 mm, 12V modules are made of a power of 140-160W. If the elements in the module are not square and do not correspond to the dimensions 125x125 mm or 156x156 mm - they are very likely made of scrap. In other words, if there are many elements in a small module, this module is most likely made of waste.